Sports drinks have been around a long time and for many athletes they're more convenient than energy gels. Unfortunately, most sports drinks are not much more than artificially colored sugar water that does little to aid your performance and even less for your health. That is why we developed HEED as a healthy alternative for you. HEED’s subtle tasting, all-complex carbohydrate formula goes down easily and supplies you with consistent, long-lasting energy and the electrolytes you need to keep pushing the pace. Because we add no citric acid to the formula, it will not burn your throat or stomach no matter how long you drink it. HEED's sweeteners - stevia and xylitol - are actually good for you, xylitol being especially beneficial for helping promote oral health. The full-spectrum, all chelated mineral, electrolyte profile helps satisfy your body’s mineral requirements. L-Carnosine and Chromium Polynicotinate help to buffer lactic acid and support stable blood glucose levels. If you prefer sport drinks over energy gels or like to use the two together, try HEED… and find out what a sports drink done right can do for your athletic performance. 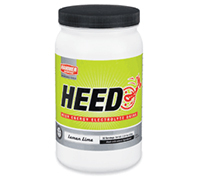 HEED may be used as the sole fuel during exercise lasting up to two hours, fulfilling all your calorie and fluid requirements, and most-to-all of your electrolyte needs.HEED may also be used as a partial source of calories and electrolytes when exercising for periods in excess of two hours.